Educating children by captivating them in new and innovative ways! The show was created in early 2014 by Stevin John, a creative entrepreneur with a background in brand development, digital content creation, and online marketing. “My goal with Blippi was to bring positive emotions and memories to the act of learning.” After few weeks of doodling wardrobe ideas, brainstorming on the characters name, and jotting down video topics, Stevin decided to host the show himself. Blippi is an energetic and loveable character clad is orange and blue that jumps off the screen with his goofy mannerisms and friendly demeanor. Children from the ages of 2 to 7 years old across the world have quickly taken a liking to Blippi’s charismatic personality and innovative teaching lessons! The show has been a hit thanks to Blippi’s appeal to both children and parents. Children become great friends with the lovable Blippi persona, and parents appreciate the interactive and educational teachings. Blippi has taught millions of kids how to count, colors, letters, and much more! 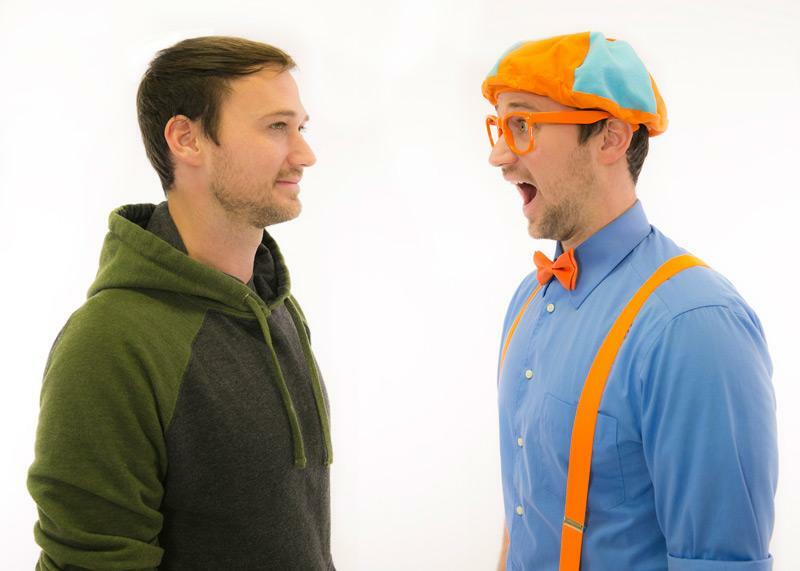 The number of fans and views proves that Stevin and his small creative team achieved their beginning goals, but is only the beginning as the Blippi team hopes to allow even more curious young eyes to view this unique content. The vision is to take the Blippi character on the road, to allow children to see the real Blippi in their hometown. With such captivating and distinctive content, Stevin plans to reach more children with his show on every available platform—including television, movies, live shows, and new media. Stevin grew up in a small town where he was surrounded by tractors, cows, and horses! When he was young he wanted to be a limousine driver. On his journey to becoming Blippi, Stevin has been a dishwasher, courtesy clerk, waiter, C-17 loadmaster, SEO specialist, and cameraman. After his duty of being Blippi is fulfilled, maybe he will go on to become the limousine driver he has always dreamed of becoming.